I am currently working in Phnom Penh, Cambodia. Although cities are not the ideal places to do birdwatching, I always visit the temples in South East Asia to see what birds there are in the specific area or to see if there any unusual birds. The reason for this is that in Buddhist belief it is tradition to set birds free at temples. This is also referred to as merit release where you can pay a certain amount of money to release a caged bird. The purpose of releasing the birds is to "give life to the other being, and by giving life to make merit". While the tradition of 'merit releasing' birds is rooted in Buddhist principles of compassion, this tradition has a devastating effect on the birdlife in the region. Today I visited a small temple right across the Palace of the King of Cambodia on the banks of the Mekong river. I was again shocked to see the amount of birds that were crammed into small cages. 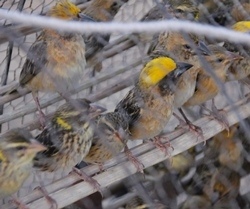 I saw more than 200 Baya Weavers (Ploceus philippinus) and Streaked Weavers (Ploceus manyar) in one of the cages. As I am a keen PHOWN fanatic, I asked them where they caught the birds as to enable me to photograph their nests. The lady selling the birds told me that they catch them in the provinces far away from Phnom Penh. 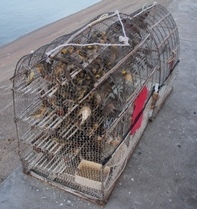 This means that they are transported for hours to where they are sold. Many are in such a weakened state that they are hardly capable of flight after their release. 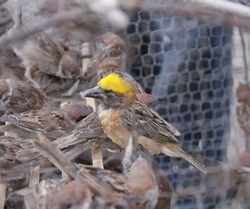 They also feed seed to the birds and the insect eaters like Barn Swallows, Sand Martins, Bee-eaters and in some instances even owls and hoopoes are so malnourished that they are unable to fly away and after being released are quickly caught again by the bird sellers to be re-sold to people who are keen to release them to score a few merits. It seemed to me that the most abundant birds were weavers, Scaly-breasted Munias and sparrows. What a sad start for the PHOWN experience in Cambodia.